Holy Cross QB Sean Santos was one of the most successful quarterbacks in high school history as a four year starter. Throughout his career, he threw for over 8,000 yards and over 70 touchdowns. (Photo provided by Sean Santos). Back in 2005, there was a hot prospect playing quarterback for Holy Cross in New Orleans named Sean Santos. Santos was only 6’0 at 185 lbs but he played the game much bigger than his size indicates. With all the great quarterbacks that played in the always strong Catholic league in New Orleans, it is Santos who is the all time passing leader at the school. Santos has also had a great coaching career as well and has a very illustrious football career in the state of Louisiana. For Santos, however, he remembers how he got involved with the game of football for the very first time. Also, at an early age, Santos’ father was a member of the U.S. Military and was a retired colonel. Santos was originally from Metairie and moved to a couple of stops before moving to Louisiana in Chalmette for high school. Even though Santos’ father was very discipline as a retired military colonel, his father had a huge influence on him to play the game of football. Speaking of his high school career, Sean Santos enrolled at Holy Cross High School in New Orleans. Surprisingly, it was with the help of another New Orleans Catholic school that inspired Santos to attend Holy Cross High School. “When I was in fourth grade in 1996, my dad took me to my first Holy Cross-Jesuit game ,” Santos said. “I could remember that game going into overtime and the Holy Cross quarterback ran in for the touchdown to beat Jesuit. It was a very memorable moment for me and I was about to head into fifth grade and I could see my dad push me to go to the school that he went to and also where my grandpa went to but that moment definitely inspired me to be in a similar situation and to play in that great Holy Cross-Jesuit rivalry. The Holy Cross and Jesuit rivalry oddly enough is going to be played this Friday. Anyway, that decision to attend Holy Cross High School proved to be the right choice not only for Sean Santos but for the football program as well. Santos started at quarterback for the Tigers for all four years. He broke all the school’s records as a sophomore and ended his prolific high school as the Catholic league’s all time leading passer with 8,355 passing yards with 77 touchdowns. With all the success he has had at the school, Santos is still humble about his past accomplishments. His success on the field led to a lot of attention from D-I colleges including Alabama, Kentucky, LSU, Miami, and Texas Tech. Santos loved every minute of the recruiting process. Santos experienced the whole process firsthand in the mid 2000’s and over the next ten years, he believes that it has changed a lot. Even though, there were a lot of D-I colleges offering the star quarterback from Holy Cross but in the end, he decided to take a different route and commit to play football for the Northwestern State Demons and it was because of a tragedy that happened. During that time, tragedy struck again. Hurricane Katrina hit New Orleans which was the area that he played football and basically grew up in. It was a tough moment for Sean Santos and his family and described it as a huge wakeup call. Sean Santo’s football playing experience was not as prolific as his Holy Cross playing career but felt that the experience was something that he needed and allowed him to have the job that he has today. 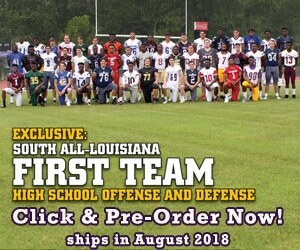 Coach Sean Santos has been to a lot of places throughout the state of Louisiana coaching high school football. He has been an assistant coach at East Ascension and St. Michaels before making his big break as the head coach for the University of New Orleans. For Santos, there was a lot of pressure on him to run a college football program especially it is located in the city where you were basically a star quarterback in. The transition that Santos had to make from coaching high school to college was surprising as well. After his college football coaching career was over, Santos went back to the high school level where he was an assistant at Brother Martin High School with an old buddy of his in Lance Lacoste who was a teammate of his at Holy Cross and Northwestern State. Lacoste actually played wide receiver for Santos at Holy Cross and their relationship still continues today because of all the time that these two were together from their times at Holy Cross to coaching together at Brother Martin. Lacoste reflected on his relationship with Sean Santos which actually started at the park grounds. After Santos’ coached at Brother Martin, he received his current job coaching for St. Paul’s. As of right now, the Wolves are 3-1 and Santos hopes that this is the team that he stays with the longest. He loves his current job working with the kids and doesn’t believe it to be a job for him at all. Sean Santos has done a lot of things that many great football legends have really never done. He started for all four seasons playing quarterback in a tough league and broke many records there. He was heavily recruited and got to play quarterback in college. Santos coached in the high school level and was even a head coach in the college level. Just to think all these great moments, records, wins, and memories all started when a six year old just wanted to play park ball! Next: LAFM TV 11th Season! Episode 3!